As far as footwear trends for women are concerned, there are certain rules that aren’t etched in black and white but are still followed religiously as if carved in stone. For instance, no woman would wear flip-flops to the office or sport high heels when going to the beach. But when it comes to boots, the odds are surely in women’s favor! Because they come in a variety of different styles, length, and designs, boots are a highly versatile type of footwear that is super trendy and suitable for wearing on several occasions. Depending on the type that you choose, boots can give you a chic, edgy, luxe or elegant look. 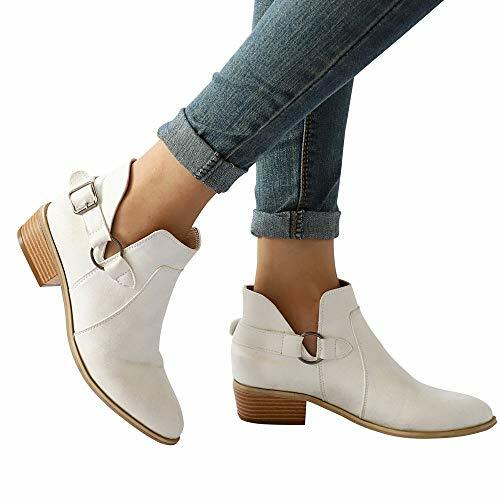 So, whether you need some help in deciding which one’s best for you or you want to find out all the available options for these boot-iful shoes, read on to discover the different types of boots for women that you can purchase from the market. Note that the following types of boots have been classified according to length, material, and heel. Some varieties might overlap but all in all, by the end of the list, you will have amped up your boot-knowledge (and will be rushing out to refresh your shoe collection as well). The earliest known mention of boots dates back to around 12,000 BC where a Spanish cave painting shows the footwear sported by both men and women, although in different materials. It wasn’t until about 3000 BC that the Minoans from the Greek island developed boot-making into a skilled trade. Historically, the purpose of wearing boots was to protect the feet and legs. While they surely do serve the same purpose today as well, the fact is that modern boots have become more of a fashion statement. Although the typical image that pops up in one’s mind when they hear the word ‘boots’ is a shoe that covers the foot and the ankle, extending up to the calf (or even knee), today there are numerous styles of boots lining the shelves in shoe stores. Check out what you have been missing and up your glam game. The first step for buying your ideal pair of boots is to decide which length you will like to sport. 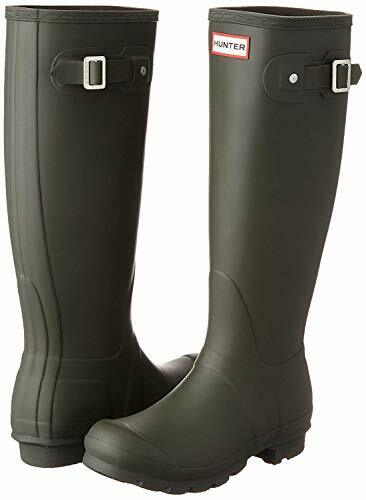 These boots are the tallest types of boots because they have the longest shaft (the part of a boot that covers the leg) that reaches up to your thigh. They are often the go-to winter shoes for women who live in extremely cold regions because they offer the most warmth and protection. Thigh-high boots can also be worn in warmer seasons given that they are made from a lighter material. These boots best fit the image that a common man has when it comes to boots. Longer than the calf-length boots, the knee-length boots extend all the way up to your knee. These boots can be worn on skinny jeans but most women prefer sporting them with short skirts to look extremely chic and stylish. 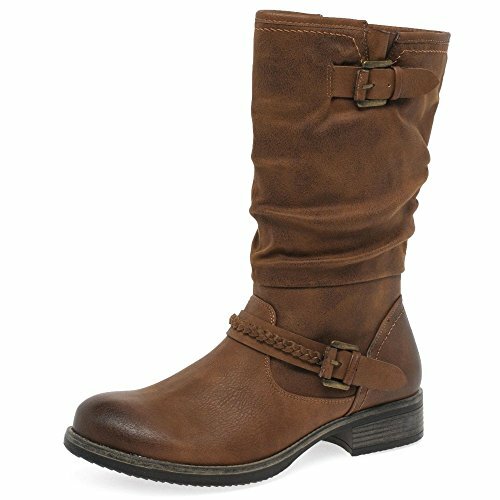 Boots that cover your calves in addition to covering your feet are called calf-length boots. These boots normally have a zipper at the front or at the sides to provide ease while putting them on and taking them off. 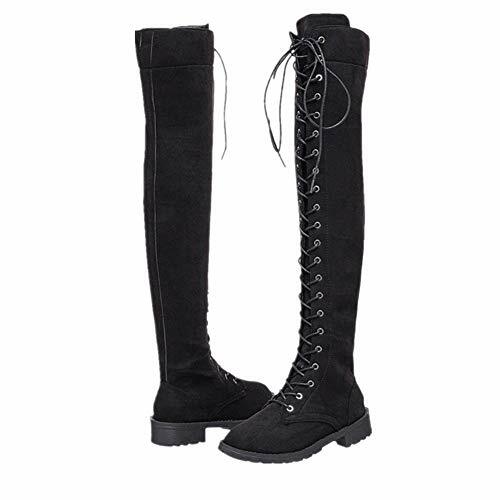 Some calf-length boots may have buttons and/ or laces instead of a zip. As the name suggests, these boots cover your foot including the ankle. Ankle-length boots are usually made of suede or velvet and often come with platform heels. Chelsea boots are the most popular type of ankle-length boots. Completely opposite to the traditional boots that cover the mid-calf at least, below-the-ankle boots feature a low-cut foot cover that ends beneath the ankle. They normally have high heels and closed toes in order to distinguish them from sneakers, regular heeled-shoes, etc e boot strap. Any boot that incorporate. These boots are usually worn with long jeans or trousers. Velvet boots ooze style and elegance but they are not recommended for rough use. This is because dust and dirt are quick to mark velvet and getting rid these spots can be a quite challenging task. So as long as you don’t go hiking or walking on rough terrains while wearing these shoes, velvet boots are a must-have for every woman. With their sophisticated and refined look, they can be your savior when you are running late for some event and cannot spend too much time on carefully picking the right outfit. Just sport these boots and you will be turning heads wherever you go. Leather boots are poise and exquisiteness personified. These classy boots are not just one of the most popular types of boots amongst both men and women all across the world, but they are also one of the oldest types of this footwear. Another reason why these boots reached this historic popularity is that because of the material, they are really durable and long-lasting. Plus, leather boots are super easy to clean and easy to maintain. Whether you accidentally spill tea or water over your leather boots or walk into a puddle, wipe these shoes with a clean wet cloth and they will be as good as new. This is a luxury that you cannot afford if you were wearing velvet boots. Suede refers to a soft and velvety type of material that somewhat looks like sandpaper (except that it is smooth to touch). Suede is basically a modified type of leather but it appears more luxurious and extravagant than plain leather skins. Boots made of suede go well on both, formal and casual events because they evoke beauty and grace. The name might seem confusing, but patent leather does not really refer to a type of leather that is only available from one vendor or the likes. In case you don’t already know, patent leather is a type of material that is shiny, glossy, and waterproof. Boots made from patent leather have a lustrous surface that gives these shoes a refined and polished look. They normally come with medium to high pencil heels which further accentuate the fashion vibes. Needless to say, wearing this type of boots will make you shine and stand out amongst the crowd (quite literally). 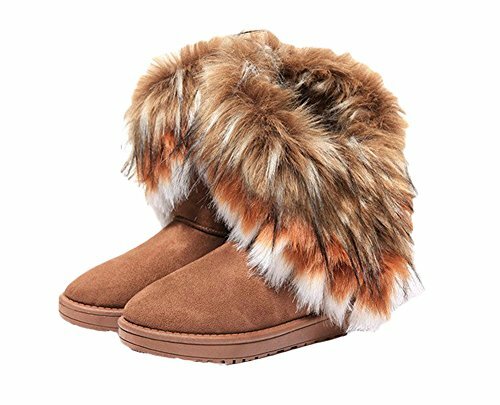 These boots have a soft and plush, fur-like lining along the inner walls of the shoe. 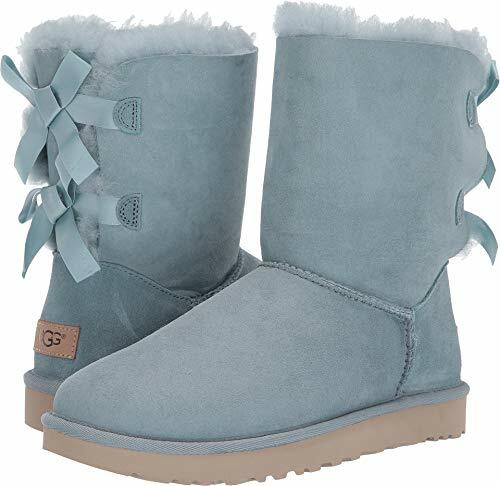 Fleece-lined boots are more commonly known as UGGs although the later is basically a brand name for fleece-lined boots introduced by an Australian company. There is no denying that the name UGG sounds a lot like the word ‘ugly’. In fact, it is said that the name was derived from the same because that is what the first pair of these boots looked like – ugly! However, modern fleece-lined boots are anything but ‘ugh.’ Highly stylish and super comfy, these cozy boots are a girl’s best friend when it comes to treading the snow-covered footpaths during winter. Wear these cute shoes with skin fitted jeans and a baggy sweater and prepare to receive compliments on your dressing sense. 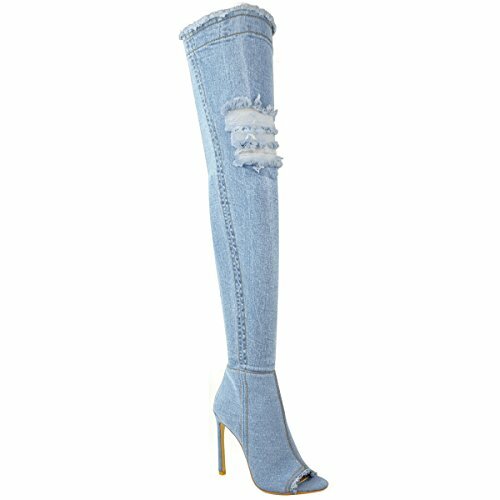 As is evident by the name, denim boots are a type of fabric footwear that usually comes with high heels and in a knee or thigh-high style. 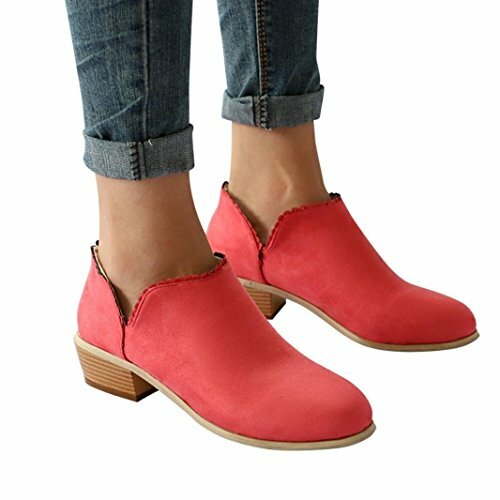 These boots make a unique and fascinating substitute for regular jeans and always look stylish regardless of which season you wear them in. Another advantage of denim boots is that, in most cases, the boot shaft is foldable so you can adjust the length to your liking. PU boots refer to boots made from polyurethane. Polyurethane is a synthetic material that is manufactured with bi-cast leather. It is often called faux leather because its texture resembles the same. However, PU boots are more durable and less expensive than their leather counterparts. So, if you are on a tight budget, opt for PU boots because they are the definite combination of fashion and functionality. 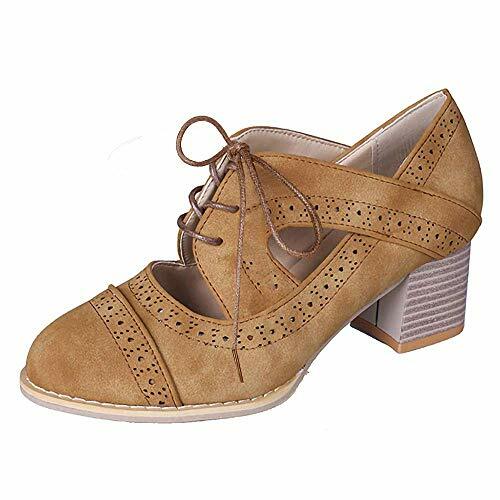 Lace boots are generally a further classification of suede boots or boots made from any other material such as velvet. These boots have a lacy part at the front or a lengthier strip of lace running along the bootstrap. 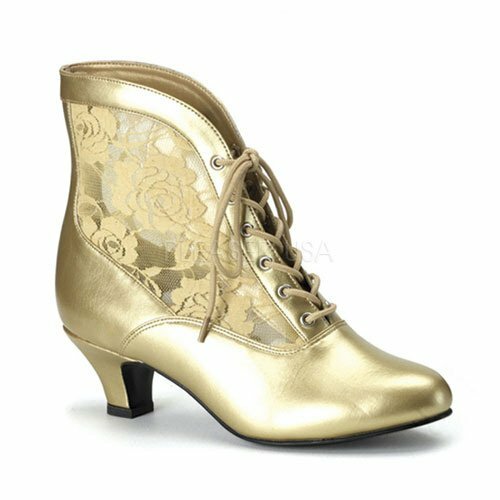 Any boot that incorporates a bit of lace into its design can be termed as lace boots. These boots are best suited for date-nights or any other day when you want to give your outfit a fancier finishing touch. These boots are taking over the winter wardrobes big time. Faux-fur boots are making big rounds because they are made from artificial fur and do not involve any cruelty against animals. 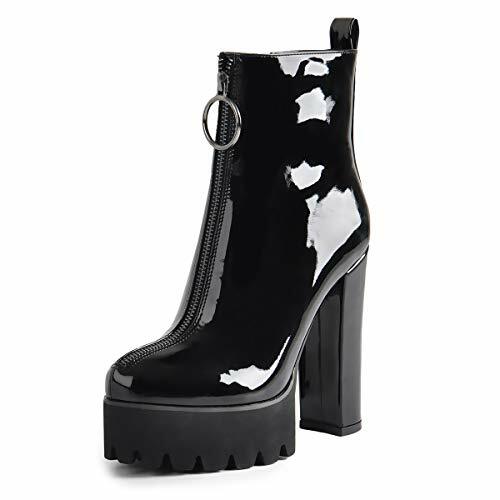 If you are an impulsive woman who buys whatever she likes at a first glance, you probably already found one of your favorite boots in the list above. But if you follow a more systematic approach when shopping then the last step for selecting the boots that are best for you is to decide on the heel size. Here are the main types of boots classified according to heel size. 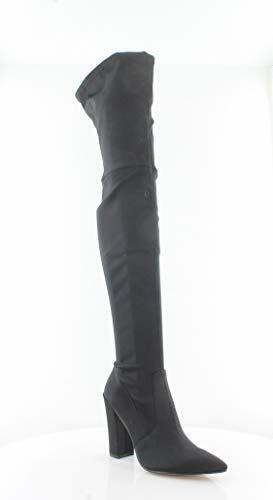 These boots feature a slim and slender, pencil heel that might be medium-sized or really long. Sleek heeled boots like these go well with various outfits including dresses, trousers, skirts and many more. Sport stiletto heeled boots and you will feel like you rule the world! This type of boots features a low, platform-style heel. 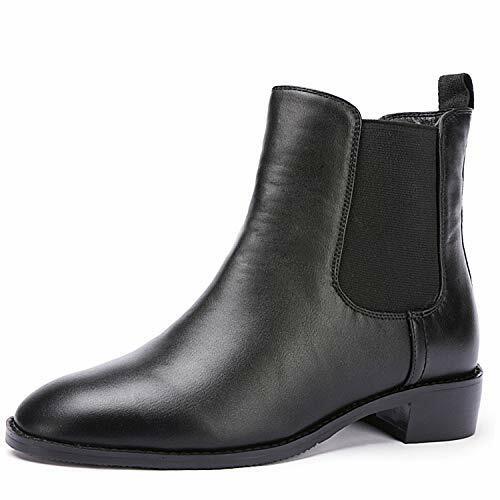 Chelsea boots are a renowned type of low-heel boots that are close-fitting and include an elastic at the side to provide flexibility and ease in wearing. Such boots are a must-have for all the working ladies out there. Nothing’s classier and more comfortable than wearing wedge heels. And wedge heels with boots? Talk about looking stunning in five seconds flat! 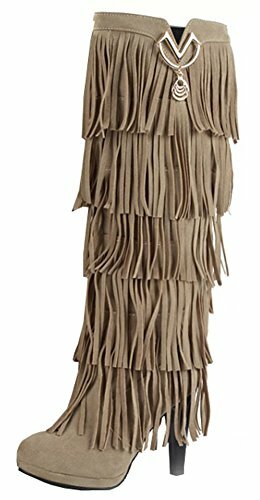 Generally made of leather or suede, fringed boots consist of hanging strips at the side. These boots are a choice good for sporting a preppy style. Boots that have laces running up along the boot shaft are called lace-up boots. These usually come in knee-high length and pair well with various outfits. Oxford boots are identified by their distinct shoelaces coupled with a punched-hole design on the foot cover. Wear them with pants or skirts – they will make a statement either way! Riding boots are basically meant for horse riders but they also make impressive footwear when combined with waist-high jeans or leggings. Exclusively designed for protecting your feet from water, rain boots are a must-buy if you live in a country that experiences a lot of rainy days. With so many attractive options available, being satisfied with just one pair of boots is next to impossible. So, which types of boots did you shortlist for buying on your next shopping trip?